Pour melted white chocolate onto foil lined cookie sheet. 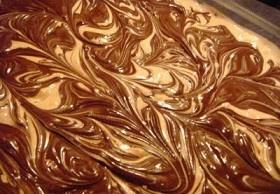 Mix melted milk chocolate and peanut butter. Spoon or pour "pools" onto white chocolate. Swirl with knife. Set up in fridge (or on deck). Break into pieces.